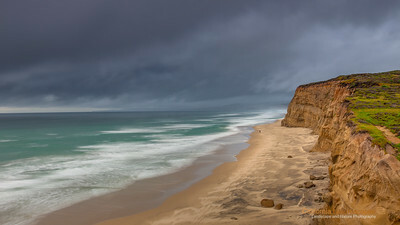 "Cliff View" Location: San Gregorio State Beach, San Mateo County, California. I have been looking for a place that gave a sense of vast open space. 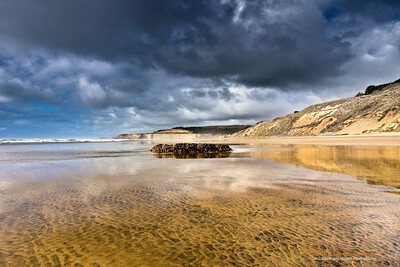 The long sandy shores of San Gregorio beach gave a perfect vantage point and during winter this beach is hardly visited, all of which helped create this image. Tech Info: Lens: Canon EF 17-40mm f/4L @40mm Camera: Canon 5D Mk II Exposure: 5sec at f/11 and ISO 50 Filters: SinghRay 2 stop ND grad hard edge California's coastal geology is unique. Within a span of few miles it is possible to see variations from rugged coastline to smooth sandy shores to dramatic cliffs as seen in this shot. This is one of the beaches where Jim Denevan has drawn in the past. What a view it would be to see his drawing from here... hopefully someday. 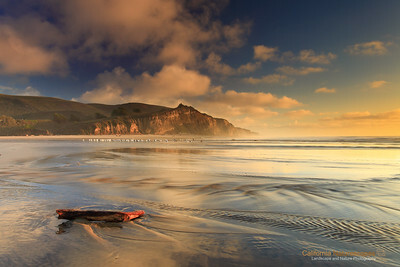 Location: San Gregorio State Beach, San Mateo County, California. 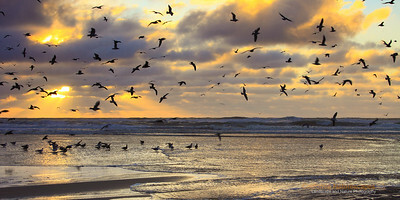 One Sunday on a California winter evening I headed back to San Gregorio beach and was greeted with seagulls who were gathered in large number almost as if there was some kind of gathering going on. I have been here many times so I know these guys like to find food in the stream that flows into this beach. Most of the time when I have tried to get too close the flock they just fly away. This weekend, however, there was a stream separating myself from the gulls which I did not want to cross and they seemed happy about the fact that I was not venturing too close to them. So I setup my gear and waited for some nice cloud activity in the background. As the clouds were breaking off I decided to capture the moment when the seagulls were dispersed in air. With these gulls in flight I felt it added bit more dynamic element to the image. The light beams in the background are my favorite things to photograph and a cloud activity that is not too dense and not too sparse makes for the best conditions for that to happen.